t was a full house with students, staff and members of the local community in the audience. The energy in the room was phenomenal for the first Centennial College TEDx at the Student Centre on October 25th; which was around the theme “resilience.” A line-up of inspiring speakers took the stage and captivated the audience with their personal anecdotes. If it’s one thing the event taught us, it’s that there is always a way. From those suffering from physical pain to social injustices; held back because of poverty, or lack of education; or those being displaced, discriminated against or abused; and even those just trying to get through everyday life; it takes a lot to reach inside and find strength! However, with some grit and persistence, we all have the power to take control of the here and the now — because anything is possible with a little resilience. Here are some of the highlights of the event, for those who couldn’t make it. “Brandon Love mesmerized the crowd with his magical tricks which definitely stole the show. We are living in an illusion of distinguishing things which we know and which we don’t, the illusion of what we think is true, and that moment is when life happens, and we surrender ourselves to our ego, the demon of “I am”. Blaming is very easy and it’s even more easy to criticize but accepting is tough. It’s hard to stabilize the mind between the feeling of right and wrong.” Brandon Love guided the audience to build ways to break all these barriers of illusions and uncertainty. Erin Wilson, who is currently a Centennial student and was one of the speakers, talked about her unique experience. For those who are fans of animated movies, “Hellboy” is one film that you must be eagerly looking forward to! It was indeed a fan moment for many to hear from and interact with Nikita Lebedev, who is working on the character for this movie. 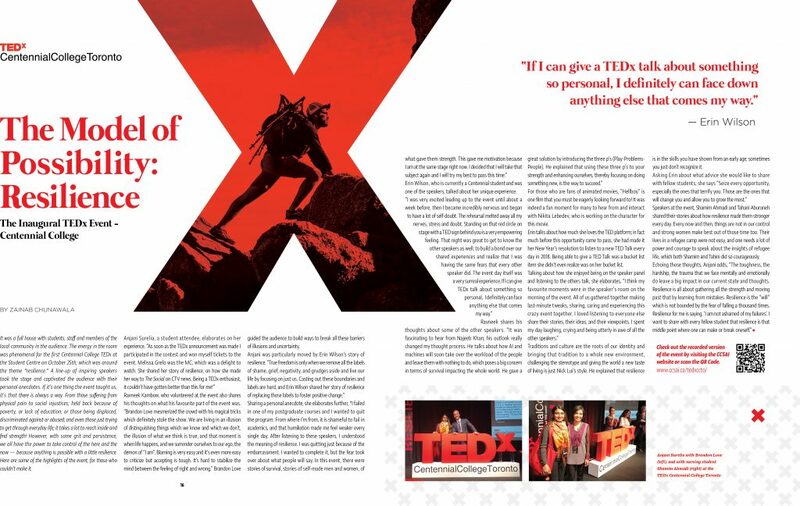 Erin talks about how much she loves the TED platform; in fact, much before this opportunity came to pass, she had made it her New Year’s resolution to listen to a new TED Talk every day in 2018. Being able to give a TED Talk was a bucket list item she didn’t even realize was on her bucket list. Traditions and culture are the roots of our identity and bringing that tradition to a whole new environment, challenging the stereotype and giving the world a new taste of living is just Nick Lui’s style. He explained that resilience is in the skills you have shown from an early age; sometimes you just don’t recognize it. Speakers at the event, Shamim Ahmadi and Tahani Aburaneh shared their stories about how resilience made them stronger every day. Every now and then, things are not in our control and strong women make best out of those time too. Their lives in a refugee camp were not easy, and one needs a lot of power and courage to speak about the insights of refugee life, which both Shamim and Tahini did so courageously.